My last post was about marinaded white anchovies – a great crowd pleaser. This is easy finger food that can be presented on crostini (oven toasted or fried bread) or on small, cup shaped salad leaves. Another small fishy bite which never fails to get gobbled up are fish balls poached in a tomato salsa. I took these to a friend’s birthday celebration recently. The fish is Rockling. At other times I have made them with other Australian wild caught fish for example Snapper and Flathead, Blue-eye and Mahi Mahi. Here are some photos of the ones I made recently. Cut the fish into chunks and mince it in a food processor. You can see the ingredients I use to make these fish balls, mainly currants, pine nuts, parsley and fresh bread crumbs . There is also some garlic and grated lemon rind, cinnamon….. and on this occasion I added nutmeg too. These ingredients are common in Sicilian cuisine but also in Middle Eastern food. This is not surprising when you look at Sicily’s legacy. For a variation use other Mediterranean flavours: preserved lemon peel instead of grated lemon, fresh coriander instead of parsley, omit the cheese, add cumin. Combine the mixture and add some grated Pecorino and salt and pepper to taste. Eggs will bind the mixture. The mixture should be quite firm and hold together. You may need to add more eggs – the number of eggs you will need will vary because it will depend on the texture of the fish and the bread. I always use 2-3 day old sourdough bread. On this occasion I added 2 extra eggs,(4 small eggs altogether) however I used 1 k of fish. In the meantime make a tomato salsa. I added a stick of cinnamon. Shape the mixture into small balls and poach them gently in the salsa. This is the link to the recipe that is also in my second book, Small Fishy Bites. I presented the fish balls in Chinese soup spoons – easy to put into one’s mouth. You can see that there were only very few fish balls left over on the festive table. There are also only five anchovies in witlof leaves left over. Of course these fish balls are not just limited to party food. They make a great antipasto or main course. Spaghetti and fish balls? Why not? Out with the old marinade of vinegar, sunflower oil, tired sliced garlic and herbs. And in with the new marinade – extra virgin olive oil, fresh parsley, garlic and a little dry oregano (optional). Sounds better already. New life, fresh taste! These are handy to have in the fridge to dip into at anytime, or to present as an antipasto on fresh bread or crostini , or inside a leaf from the centre of a small cos lettuce or radicchio or witlof – in fact any salad green that has cone shaped head and cup shaped leaves that can hold a few marinaded anchovies. The pictures tell the story. Simple to make, good to eat. Leave in marinade at least one day but as long as you keep them under oil they will last for a couple of weeks in the fridge. 2-3 cloves of garlic ½ cup chopped parsley, both finely chopped. extra virgin olive oil to cover – the amount will depend of the container you use. I always use glass. Drain the anchovies and discard the old marinade and the solids. Layer the anchovies with the herbs and the garlic and top with the oil. Store in the fridge until ready to use. If you are taking some anchovies out, make sure to once again cover them with oil. If you are presenting the anchovies inside leaves use a colander to drain the anchovies and then place 1-3 inside each leaf- this will depend on the size of the leaf and how much you (or your guests) like anchovies. If you are presenting them on bread, there is no need to drain them with a colander – the oil tastes good too. As you can see, finding small suitable leaves and keeping them whole can be time consuming. I first wrote about Marinaded Anchovies in 2011. They have remained as one of my favourite things to do for a large gathering. The recipe is also in my second book Small Fishy Bites as Zucchini and Mint Fritters with Marinaded Anchovies. My mother always said that meat and fish should never be mixed. Well, she was wrong and may I say that she had never visited Spain. The following recipe is nothing new, cooks have played around with it over time using the usual Spanish type ingredients that most of us would have in our pantries. Usually when I buy vongole I have them with long pasta (garlic and parsley, a bit of chilli and white wine), but now and again I like to play around with different flavours and because I had some chorizo in the fridge, the vongole ended up being more Spanish than Italian. This recipe is in my book second book, Small Fishy Bites . Paprika is called pimenton in Spain. It has a smoky taste, but if you do not have it use common paprika instead. Because the vongole release their salty juices when cooked, I generally do not add salt. I have also used prawns and cooked them in the same way. In the past I have also used chunks of prosciutto rather than chorizo. If you have bought your prosciutto as a a solid piece and sliced it yourself you will end up with some chunks which are excellent for cooking. I am also able to buy ends (of the bottom part of the leg of prosciutto) from the deli part of the Queen Victoria Market, but any shop that slices prosciutto would have some. As an accompaniment, just use bread to mop up the juices. I usually end a meal of this sort with a tasty green leaf salad – and I mean tasty, i.e. a selection of different green leaves with a good vinaigrette. Rinse the cockles – they are generally sold clean and unless you have collected them yourself there should be no need for you to rinse and rinse them until they are clear of sand. Lightly fry the sliced chorizo in very little oil until it starts to brown. Remove it and set aside and use the same saucepan to proceed with the rest of the ingredients. Add more oil to the pan and sauté the onions on low heat till they soften; add the garlic and pimenton, stir gently for 1 minute. Add tomatoes, thyme and wine or sherry, cover and simmer until the sauce has thickened. Cover and cook until they have opened, shaking the saucepan occasionally to distribute the heat evenly. There is a sense of celebration associated with eating fish and this recipe for rolled fish could be a good starter to a meal – great for any of these festive occasions. It is Christmas eve and I intend making these as a starter tonight. It will be a menu of all fish in keeping with the Italian tradition of abstaining from meat; this is a left over practice from days when Catholics did not eat meat during certain days in Advent, a time of expectant waiting and preparation for the celebration of the Nativity of Jesus. These little morsels are fish fillets rolled around a light stuffing– only herbs, lemon peel and garlic are used. Fillets of small fish (with skin on) are suitable: anything from mild-flavoured whiting, stronger tasting flathead to even stronger oilier fish such as mullet or sardines. They can be pan-fried in a non stick frypan with a little butter or extra virgin olive oil and then eaten with a squeeze of fresh lemon juice. You may also wish to deglaze the pan with a little white wine or use orange juice (juice of 2 oranges), these will provide a ready-made sauce. For the orange juice option you could use fresh basil as the herb for the stuffing. I have made these little rolls many times. Sometimes I have deglazed the pan with Marsala (dry), or white wine. I have also used tarragon as my herb and used vermouth. An alternative stuffing can be made using some breadcrumbs (made from 1 day old, sour dough bread), toast them in a frypan with a little extra virgin olive oil. To these add a little minced garlic, chopped parsley, grated lemon peel, a sprinkling of sugar and a little nutmeg. Pine nuts and currants can also be added to this stuffing. Fish fillets rolled around a herb stuffing is one of the recipes is in my book, Small Fishy Bites. Flatten each fillet; if using large fillets, cut into smaller strips. Sprinkle each with a little salt and pepper. Chop the herbs finely and leave a small sprig to insert at one end of the fish rolls (for decoration). Mix the herbs, garlic and peel with 1 tablespoon of olive oil (or soft butter- this is less Sicilian). Place a little of the stuffing at one end of each fillet and roll up. Secure each roll with a toothpick and place a sprig of herbs at one end. Sauté fish rolls in remaining extra virgin olive oil and /or the butter. Add a little seasoning and bay leaves and continue to cook the fish until it is ready. 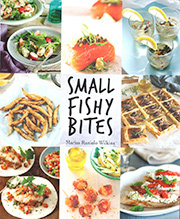 My second book, Small Fishy Bites, was released by New Holland on 1 October 2013. To mark the occasion, on the evening before, friends joined me for a celebratory dinner at the Moat Bar and Cafe in Little Lonsdale Street below the Wheeler Centre. The Moat was the perfect place to launch the book, enjoy excellent food and wine – a brilliant match for the occasion. Thanks to all my friends who enjoy eating and cooking fish and whose contributions have enlarged my repertoire of recipes. Below, photo shoot in my apartment. Food photography by Sue Stubbs, styling by Jodi Wuesterwald. Getting a chance to look in….most unusual as I spent the majority of time cooking. I took the following comment by Michelle Rowe to be a positive rather than a negative and I appreciated being mentioned in her weekly column. She praises Sicilian Seafood Cooking and for this I am pleased. And there is a hint that in spite of its title, Small Fishy Bites could be OK.
DETECTIVE accepts that with so many cookbooks out these days, it may be difficult to think up a title that has not already been claimed, but she wonders whether anybody could have fixed upon a less-inviting moniker than Small Fishy Bites? She trusts the new book from Marisa Raniolo Wilkins, who also wrote the very good Sicilian Seafood Cooking, holds more promise than its distinctly fishy title. An imaginative fusion of cultures and experiences that celebrates the diversity and versatility of seafood. Meals in today’s modern, busy households tend to focus on easy, casual but varied dishes, and Small Fishy Bites follows this tapas trend, showcasing simple, fresh meals that are perfect to share with family and friends. Each chapter reflects the cosmopolitan life of the author, who, although born in Sicily, spent her childhood in Trieste, where northern Italian cooking styles contrasted with those of her relatives in the south. Her annual experience of travelling the length of Italy on family holidays underscores her emphasis on sourcing ingredients that are seasonal, local, and tasty. Small plates are a pleasant way to sample a range of flavours, and they give even the ‘pickiest’ eaters in the family a mouth-watering selection to choose from. There’s something for everyone, meaning they are also excellent for entertaining. Each chapter covers a range from ‘Tidbits’, featuring bite-sized food such as shrimp or octopus; ‘Cases and Bases’ such as delicious blinis with caviar; ‘Soused and Best Dressed’ offering salads and soups galore; ‘Sozzled’, with oyster shooters; and ‘Hefty Shells’, including mussel brochettes … all quick, colourful, and sure to impress. 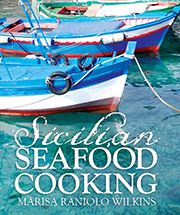 Small Fishy Bites follows the success of Marisa’s Sicilian Seafood Cooking. From an early age, she developed a fascination with food and cooking. She and her family moved to Australia in the late 1950s, settling in Adelaide, where Marisa worked in education, before moving to Melbourne. I was in Tunis recently and very much enjoyed one particular meal at a restaurant that was by locals and cooked traditional food. The restaurant was very hard to find and our map reading skills were not the best, but we were very happy with the range of food we ate there. Harissa seemed to be in most of the food we ate including some mixed in some oil, which was served as a dip as a starter. It had slices of cucumber and black olives in it. The other was a carrot dip also with Harissa.We dipped our bread into both of them. I have been making and eating harissa for many years. Harissa is a hot chilli condiment and ingredient and is the favoured national spice of Tunisia, but it is also popular in Algeria and Libya. It is very common to have harissa with couscous and I first tasted it in Sicily many years ago, which is very close to Tunis. There are now many books about Middle Eastern cuisine (and North African) with recipes and variations for making it, but this version is very simple. I like to use whole caraway or cumin seeds rather than the powder and I do not usually weigh the chilli flakes, but the following ratio works well. In Tunisia they use a dry, very dark whole chilli, which produces Harissa with an intense colour. The chillies could also be smoked (hence their dark colour). This photo is in my second book Small Fishy Bites and I took it in Tunis. Pour hot water on to the chilli flakes, (just enough to cover them) and soak for about 30 minutes. If using caraway seeds rather than powder, add these to soak as well. (The water will be absorbed and the flakes should swell). Blend the ingredients in a small food processor. Add the garlic, salt and some the extra virgin olive oil. You may need to add a little water – it should resemble a soft paste. Pack into small glass jars and top with oil to seal. Replace the oil covering each time you use it. To make the Harrisa flavoured oil simply mix 2-3 teaspoons of Harissa in about 1 cup of extra virgin olive oil. I had some saganaki recently at a friend’s place. She did the usual thing of cutting it into large cubes, dipping it in a little flour and pan frying it in hot oil until golden, but she then added a drizzle of Ouzo over the hot cheese, and lit it – (Flambé). Finally she added a squeeze of lemon juice. We ate this with some tomatoes that had been slowly baked on a low temperature. It was the Ouzo that interested me. I particularly like the taste of aniseed and us a lot of fennel in my cooking. I also use wine quite often in my cooking and sometimes if I wish to accentuate the taste of the fennel I use Ricard or Pernod – both are anise flavoured liqueurs. I have also used Ouzo at times (based on a Greek way of cooking them) and recently I cooked some mussels with Sambuca; they make a great antipasto. When travelling in Italy to places on the coast in summer, you will often see piattoni (large platters) of mussels presented as a stater to a meal in restaurants; these are a great favourite. With the warmer weather, I have enjoyed placing a large platter of mussels in the centre of the table and having guests help themselves. The mussels I cooked with Sambuca were greatly appreciated. Whilst I was in Adelaide recently I also ate at Ruby Red Flamingo (John Mc Grath’s review) and enjoyed an Anisetta Meletti, another aniseed flavoured drink from Ascoli Piceno and sold at Mercato (Campbelttown in South Australia). This too would work. The following recipe is in my second book, Small Fishy Bites. The food stylist and photographer are in the photo above. Sauté the garlic lightly in hot extra virgin olive oil. Use a saucepan that will fit the mussels. Add the mussels and sauté for a couple of minutes. Add the Sambuca, a dash of water, pepper and the parsley. Cover with a lid and cook till the mussels open. Remove the mussels and place into another warm saucepan with a lid to keep them hot. If you do not mind presenting the mussels warm, place the opened mussels on a platter. (Italians do not seem to bother about keeping food hot). Evaporate the juices until you only have about 1 cup of concentrated liquid. Add lemon juice and pour the juice over the mussels and serve. Purpetti – polpette in Italian– are the words for meatballs, but these purpetti are made with fish. Polpette di sarde are made with sardines and are very popular in Sicily, however other types of fish can be used. In my version of fish balls I have used a combination of snapper and flathead (sustainable in Victoria), but any firm skinless, non-oily fish is OK. You will need a meat grinder or a food processor to mince the fish. Polpette made with fish can be made with as many combinations of flavours and particularly common around Catania is the combination of grated pecorino, garlic and parsley – the same as for making meat balls. I like to add grated lemon zest and cinnamon as well. The polpette can be fried and served plain with a squeeze of lemon or poached in a tomato salsa as I have done on this occasion. I presented them to friends simply served with bread and accompanied with some roast peppers and a green leaf mixed salad with radishes – perfect for a light lunch. This recipe is in my second book, Small Fishy Bites. Cut the fish into chunks and mince using a meat grinder or food processor – I do not like it to be too fine. Combine all of the ingredients – the mixture should be quite firm and hold their shape. Shape into small balls. In a saucepan large enough to hold the polpette, heat ½ cup of extra virgin olive oil, add a clove of garlic, a little salt and 500g of chopped and peeled red tomatoes (canned or passata). Heat the salsa to boiling then lower the heat and reduce to thicken slightly for about 5 minutes. Bring to boiling again. Add the polpette to the tomato sauce, cover and braise for 8–12 minutes. Leave to rest in the sauce for at least 5 minutes – this will help them to set.